Millions in Gold FREE for the TAKING! The author of this article tells you exactly where you can find $125,000,000 in gold—and it’s all yours the moment you lay hands on it. The difficulty is that the gold is buried in the hulks of wrecked ships several hundred feet beneath the sea. Inventors of diving contrivances are staging a frantic race to see who will be first to retrieve the golden fortunes. STORIES of buried treasure, hidden by Lafitte or Kidd or concealed somewhere about the old homestead by the wealthy farmer who was afraid of banks, usually have this one feature in common: although the existence of the treasure is well-authenticated and widely credited, nobody knows exactly where the hidden doubloons have been laid to rest. But in the case of the treasures dealt with in this particular story, no such depressing uncertainty as to their locations exists. You may have these treasures for the trouble of taking them—$125,000,000 worth—and scores of men can tell you with a surveyor’s accuracy just where to find them. The difficulty is that these treasures lie at varying depths beneath the surface of the sea, carried down in all sorts of sunken vessels. Water pressures and submarine difficulties have, until recently, protected this buried gold as effectively as if it were locked in steel vaults. But now, with the development of remarkable new types of diving apparatus, these long-lost treasures seem destined to be recovered. 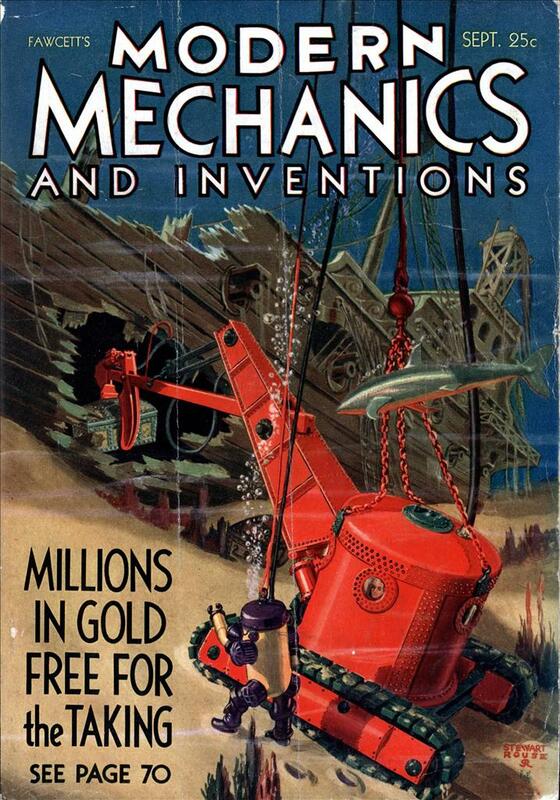 Mechanical ingenuity, as expressed in the perfection of a number of unique types of diving suits and elaborate salvage equipment such as the submarine tractor-shovel shown on this month’s cover of Modern Mechanics and Inventions, is tackling the sunken treasure problem with a vengeance. If you can devise diving equipment which will enable you to tear apart sunken ships, your chance of walking off with enough gold to float a government loan is as good as the next man’s, since the rule of “finders keepers” applies to the first man who succeeds. There’s nothing fantastic about the device illustrated on our cover, bizarre as it is in appearance. Photos of a submarine tractor, actually constructed and ready for use, are shown elsewhere in this article, and the steam-shovel arm is a modification of an idea now being worked out by Andrew Raiche of Boston, who expects to descend to depths of 1000 feet. The claw-like pincers of the tractor are operated by compressed air, furnished through a supply pipe leading from the mother ship above. The diving bell itself is hermetically sealed against the tremendous water pressures, and its purity of air maintained by supplies of canned oxygen and soda lime to absorb impurities. This is the system of ventilation employed by William Beebe and Otis Barton when they descended to a depth of 1426 feet in their “bathysphere,” or diving bell. Their purposes, however, were purely scientific and had no connection with treasure recovery, beyond pointing out the practicability of diving much farther than had been supposed possible. 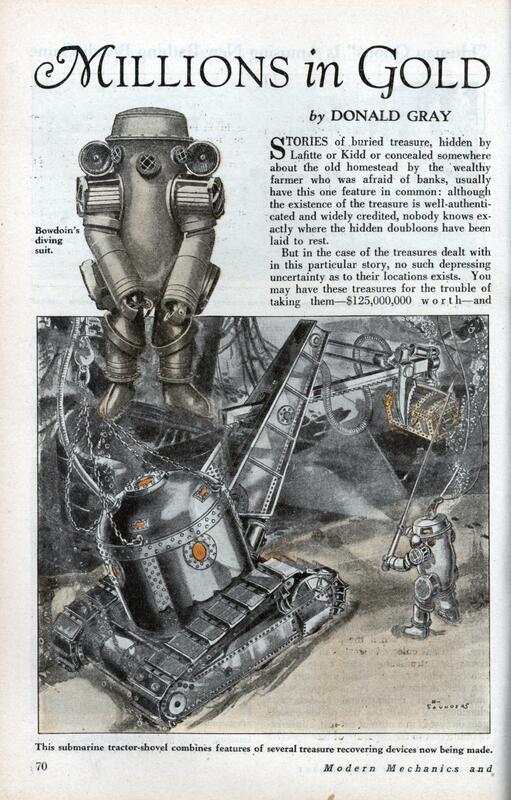 A diving suit which its inventor, Harry L. Bowdoin of New York, calls an underwater robot, and which he claims is the first practicable all-metal diving suit ever designed, is about ready to undergo its first tests in the recovery of some $4,000,000 from the sunken ship Merida, which went down in 1911 off the Virginia capes in 300 feet of water, carrying gold, silver, and crown jewels of Mexican notables fleeing their country on account of revolutions. Mr. Bowdoin claims his suit can carry a man down 600 feet without danger, and the water-tight joints in arms and legs work freely at this extreme depth, contrary to many other diving suits of the type whose joints “freeze” under water pressure. A ship has been chartered for salvage operations by Mr. Bowdoin, and a corporation for the purpose of recovering sunken treasure is in process of financing. In common with practically all deep-sea diving suits, the underwater robot is equipped with powerful lamps to enable the operator to see what he is doing hundreds of feet beneath the surface. Organizing a submarine treasure hunt isn’t so easy as it seems, even with plenty of equipment. Take the case of the Artiglio, the Italian ship which was outfitted to recover the $5,000,000 in gold which the liner Egypt carried to the bottom off the French coast. After locating the wreck, and actually recovering a safe from the captain’s cabin, the Artiglio was destroyed in an explosion when some of the powder carried on board was touched off accidentally. However, a sister ship is being fitted out to carry on the salvage work. What are some of the big treasures worth going after? Well, there’s the Hussar, a British pay ship which sank during colonial days. Simon Lake, who has recovered thousands of dollars worth of sunken valuables, is laying plans to salvage this gold. He identified the wreck from an anchor recovered by divers in Hell Gate, that treacherous channel in Long Island Sound. Then there is the Principe Asturias, which ran on the rocks off Brazil in 1915, carrying $5,000,000 in gold. A company is being organized by a group of business men to recover this treasure. From Vienna comes word that a syndicate of engineers is planning to raise two ships from the bottom of the Danube, sunk in a battle with Turks in 1526, carrying much gold-plate. The steamer Islander, which sank in Stevens Passage, Alaska, in 1901, with $3,400,000 in gold dust, is being tackled by Curtis Brothers, Portland and Seattle house movers, this summer. Charles Haskell of San Francisco is going after the gold-laden Rio de Janeiro, which went down off the Golden Gate in San Francisco Bay in 1901, carrying $3,000,000 in gold bullion. The big prize of them all, however, is the Vigo Bay plate fleet, which went down in 1703 with $100,000,000 worth of gold and silver ingots—the largest known lode of “drowned gold.” The fleet consisted of Spanish galleons carrying three year’s production of gold back to Spain from the New World. Encountering hostile English and Dutch vessels, the galleons were scuttled by their commanders rather than have them fall into the hands of the enemy. Location of the wrecks in Vigo Bay, Spain, has been carefully surveyed by the Spanish government, which offers 80% of the value to anyone who recovers the gold. Other treasures besides gold lie ready for recovery from the sea. Simon Lake, inventor of the submarine, mentioned a few paragraphs back, says there is big profit in salvaging coal from the sea. Millions of tons have been lost in Long Island Sound alone. On one occasion Mr. Lake’s diver was released from a hatch in a submarine, located a wrecked coal ship, and got to work. In exactly nine minutes 15 tons of nut coal was pumped from the sunken ship aboard the cargo submarine, which carried it to the surface and transferred it to barges. Simple and profitable and netting a handsom? profit! Gold, silver, and copper remain good for centuries, though submerged under water, although ships themselves deteriorate. Iron ships corrode rapidly in salt water and wooden vessels are attacked by a boring worm. One of the most valuable cargoes ever salvaged by Mr. Lake was a boatload of copper which sank off Hamonassett Point, Long Island. Incidentally, there are more than 30 ships which went down in the waters of Long Island Sound, of which Mr. Lake has record, which are worth salvaging. Here’s a new Captain Kidd’s stamping ground. Hazards of searching for submarine treasures are, in Mr. Lake’s opinion, insignificant. He has never heard of a single diver, attired in a regulation suit weighing 200 pounds, being attacked by a shark. He admits that there are octopuses and devil-fish, but a diver rarely meets one of these creatures. And of course the diver is always in constant contact with his ship. The richest successful submarine treasure hunt was that which recovered $35,000,000 m gold from the liner Laurentic, sunk off England during the war by a German submarine. The ship went down in something over 200 feet of water. At first, attempts to salvage her contents failed, but eventually successful contacts were made, and every piece of gold was recovered—a remarkable record. Not a single coin was left for Davy Jones. A portion of the gold contained aboard the Lusitania has also been recovered, but the breaking up of the ship and the burying of its parts under seas of impenetrable mud and sand made a 100% recovery impossible. The liner Titanic, which went down in 1912 after striking an iceberg, sank in 1500 feet of water, too deep for salvage operations unless new equipment is perfected. She carried a rich bullion cargo which, like that of other ships, lies patiently awaiting the hands which will recover it. Yeah, you’ll spend years researching and searching, millions finding and recovering, and some government or other will sue you claiming it all belongs to them. I know about as much about diving as I know about the folk songs of natives of the Andromeda galaxy, and even I laughed at that. Wreck divers don’t get eaten by sharks, or “devil fish” (a kind of large ray, which I’m not sure has ever been known to attack a human). They, rather, get stuck in the damn wreck, which is almost by definition a disorienting and dangerous environment. Even if you’ve got modern self-contained breathing apparatus, never mind a 200-pound suit with an air hose. You don’t have to go very deep in the ocean before you’re in an environment much more dangerous for humans than spaceflight. The Kursk went down in water so shallow that if it were standing on end a third of the submarine would have stuck up into the air, and still nobody could get to the crew in time. …the Royal Navy did recover very nearly all of the gold, but had to dig 10 metres into the seabed to get some of it, and it took them five thousand dives. Fifteen years later there would be untold millions of dollars worth of ingots of copper, aluminum and other wartime strategic metals lost in the Atlantic and ready to be recovered. One particular company (forget the name) did go and scoop most of it up, presumably making the owner a very wealthy man.